So I had originally had grand plans to take off directly from Luang Prabang to Vietnam...but through my travels, over and over again, I had people tell me "You have to go to Vang Vieng in Laos." So many times. I was hesitant because (nerd alert) I saw this show awhile ago about Vang Vieng - it basically looked like pure hedonism - tons of drunk partiers in swimsuits tubing while riverside bars poured buckets of alcohol and opiates down their throats - like Spring Break on the heaviest dose of steroids imaginable. Not that I'm against Spring Break funzies, of course - but it didn't seem to be a must-see on my list. However, everyone I talked to raved about Vang Vieng - apparently it's also fantastically gorgeous as well. So being as though I have a completely flexible schedule, I threw my plans out the window and decided to foray to Vang Vieng last-minute. 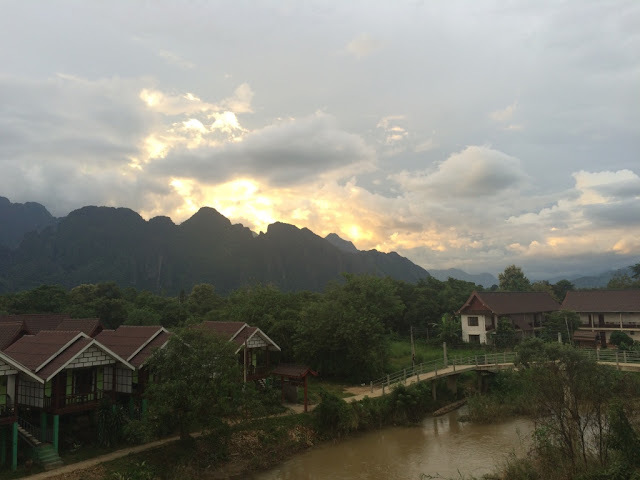 Vang Vieng is a tiny (pop: 30k) town that borders the Nam Song River; bordered by the most gorgeous mountains of all time. Vang Vieng was previously a tiny town in Central Laos that was fairly off-the-radar - a place where tourists would come to tube down the river in old tires and mellow out - until word spread around 2009 in backpacker-land that it was the next party hotspot. 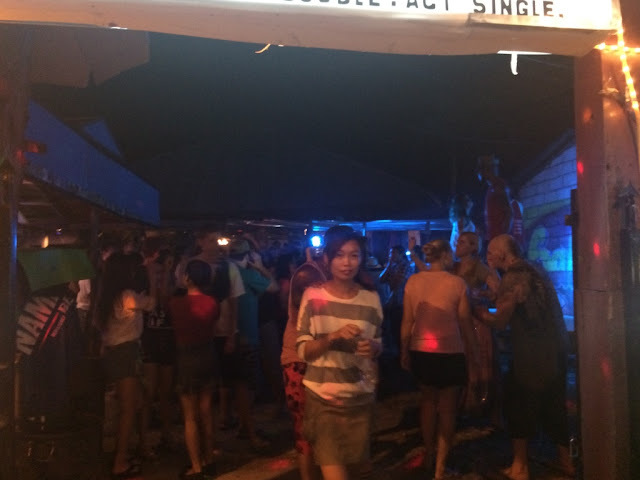 The Laotian government stepped in in 2012 and shut down all the river bars. Today, only a handful remain and the atmosphere is a lot more manageable - though the city does still have a party-ish vibe, it's nowhere near as crazy as it used to be. And yes, it is gorgeous. There's a ton of stuff to do - the obvious tubing; but also great trekking, caving, jeep tours, and other outdoor adventurous things. 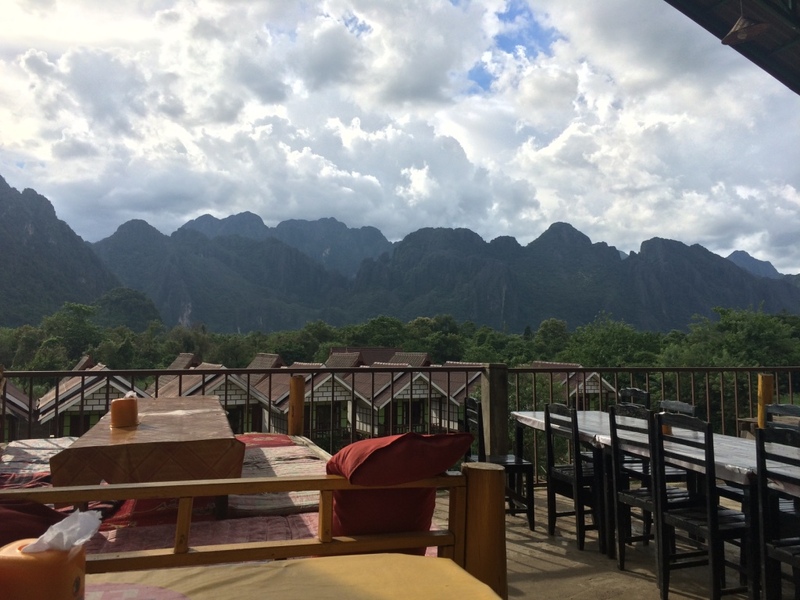 A couple of the friends I met in the hostel in Luang Prabang happened to be heading down to Vang Vieng the exact day I was, so four of us (Ellen, Jeffrey, Connie - yes, there is another Connie!, and me) took a morning 5+ hour minivan down together. Annnnd karma is punishing me for complaining about the previous guesthouse in Luang Prabang, because not only was this guesthouse even tinier (that is 6 beds crammed into the smallest room possible, folks), but it was basically an outdoor bungalow with no A/C (aka OVEN, + I had to hose myself down with mosquito spray every night), no locks on the doors (ours didn't even close), even more questionable hygiene, and grime. So much grime. I am formally apologizing to you, karma. I will never complain again. Wandered the city for dinner and drinks - everyone was right. This city is absolutely beautiful - someone had said to me earlier that it was like Jurassic Park without the dinosaurs, and it's totally true. 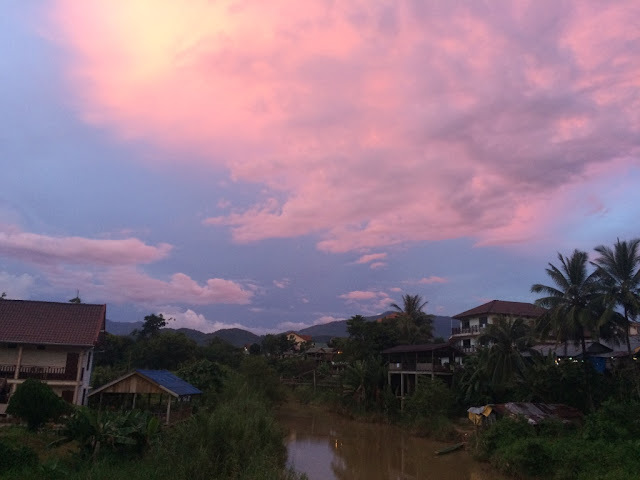 Like thick jungle-covered mountains and rivers, and insane skies. And then I took a million sunset pics. Just in case my phone doesn't have enough photos. The next day, we officially went tubing! By this time, we'd met a lot of other backpackers (most were at the same hostel in Luang Prabang; sometimes the backpacking world is very small and incestuous) - so we amassed a group and all headed down together. So the new, improved, less-hedonistic tubing basically is a toned-down pub crawl/tubing combo. There are 4-5 bars along the river, and you can tube at your own pace. The crazy thing is the river is pretty fast-moving, there are no real explanations from any staff, and each bar is kind of insane. Also, as you're floating down in these tubes through crazy fast water, each bar has kids (AND I MEAN KIDS) who throw out ropes weighted with filled water bottles - it's your job to grab hold so they can reel you in to every bar. With the combo of alcohol, water, and potential for so many things to go wrong (lose your group, lose your shoes, get caught on a rock, miss the water bottle, not finish tubing before sunset so you're in pitch-darkness, etc. ), I can definitely see how tourists died so frequently back in the day. Even with 4 bars, it was already pretty boozy - I can't imagine with 20, 30+ bars. Before we arrived, we had all already heard bad-ending stories from other travelers' experiences - one guy we met in Luang Prabang who'd come from Vang Vieng had gotten too drunk, it had gotten dark so he'd missed the tubing pull-out point, and he'd tubed so far that he had to walk 2 hours back barefoot and in the dark - he ended up infecting his foot pretty badly from the sharp rocks and had to keep it wrapped up without touching water. At the first bar they dropped us off at with our tubes, they had beer pong set up - and it was basically staffed with a whole bunch of hard-partying Europeans (they claimed they were volunteers, which basically means they work there for no pay and free booze). There were maybe 40-50 or so people that we ended up tubing with. Even if you go out and tube with your small group to the next bar, you'd always see the same larger group at the next bar - so it became kind of like a small tubing community. It was hilarious because we started tubing around 1:30pm - the tubing place had big signs with all these warnings: basically, don't kill yourself and get the tube back before dark. They have big fines if you return your tube after 6pm, and even more if you lose the tube entirely (which apparently happens more often than you think). We all scoffed, being like, "What drunken idiots would get back after 6pm?? It's almost dark by then." But then, you're having so much fun and not checking what time it is or allocating how long you need at every bar - I was standing at the 4th and last bar when Ellen ran up to me and was like, "It's 5:30pm already! We need to leave now." I have to say, tubing is set up all wrong - the first 4 bars are all within like, 30 seconds of each other - and then you have an additional 45 minutes + of tubing AFTER the bars before you get to the drop-off point. Cue to the fastest tubing we've ever done. And then before you know it, there is a rando man standing there with a sign that says "TUBING STOP." And the water is moving so fast and the river is so fat and wide - you basically have to haul yourself over to the side with full force. We all let go of each other; kicking my tube over to the side was seriously the most intense workout of all time. Overall, all things considered, I loved tubing. It's such an adventure (one that is more fun because you struggle through it with other people), the bars are all outdoor and gorgeous, and the scenery is seriously unparalleled. It's like being on a tube, and someone's dropped you into a movie. If you can get past the reputation it has for just being a drunken idiotic time (which it absolutely can be if that's your thing! ), I can see the original appeal of it. 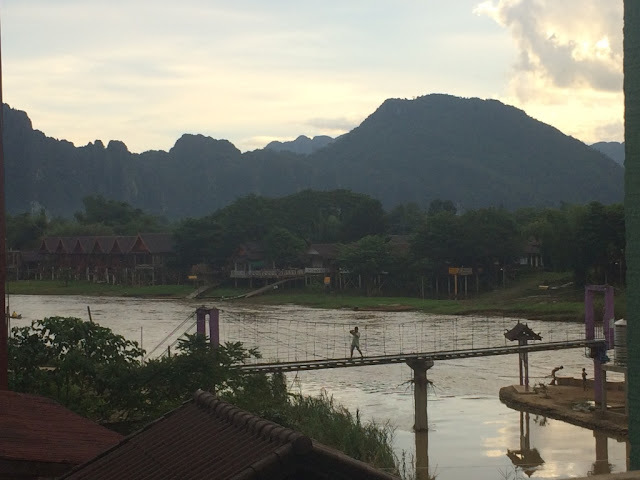 Not to mention, since the government clamped down on Vang Vieng's hard-partying ways, you see a lot more families and older travelers now in the city - people who are there to appreciate its beauty for what it is. Because it truly is so, so beautiful. 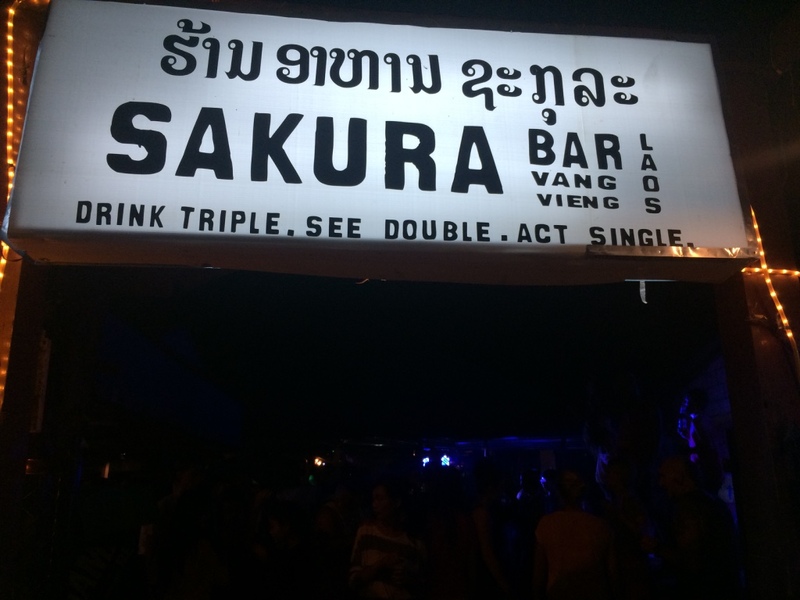 Later that evening, we stopped by Sakura Bar (where we'd been the night before as well). 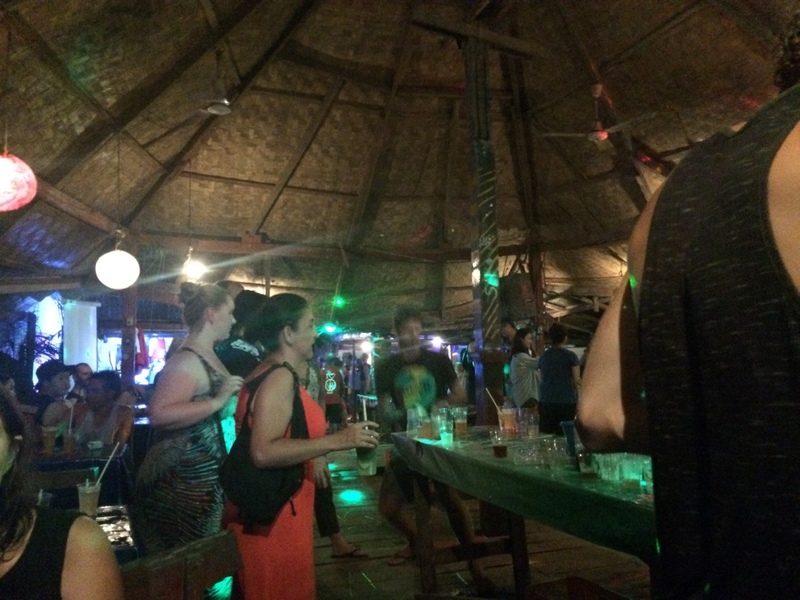 It's probably the #1 hotspot for backpackers in all of SE Asia - the gimmick being that if you buy two vodka drinks, you get a free tank. It's not a good deal. It's not even a nice tank. It's a totally crappy tank that says "Sakura Bar" on the front and "Drink triple, see double, act single" on the back. However, no matter what country you're in, you will see someone with this tank. 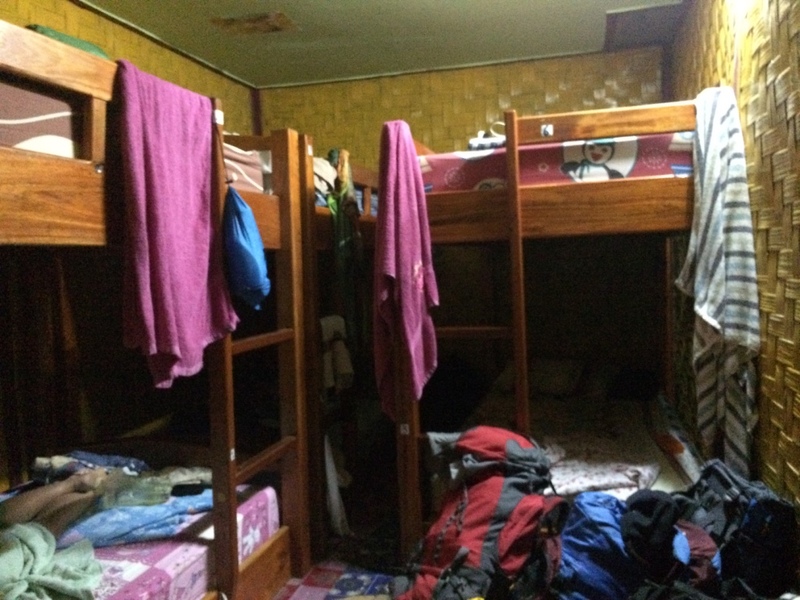 It's literally everywhere; almost like a rite of passage for backpackers. So of course, we had to go and get our tanks. And as gimmicky and stupid as it is, I LOVE MINE. Except I spilled superglue (don't ask)all down the front on night 1. Oops. Beer pong in the back. Fun fact: Europeans are terrible at beer pong. Laos' government, while constantly trying to convince others they're a democracy, is pretty much a communist, military-controlled dictatorship. I'm not sure why exactly (maybe to keep the profits for themselves? ), but they have a ban on private group transport, a.k.a. any and all buses/vans between cities. Which made the minivan from Luang Prabang to Vang Vieng technically illegal - not that I knew this beforehand! But I quickly found out. At the hostel the morning of departure, there was a group of 12 of us booked for the minivan. It was weird because when the minivan showed up, only some people were allowed to get on - the rest of us got shuttled into separate tuk-tuks. 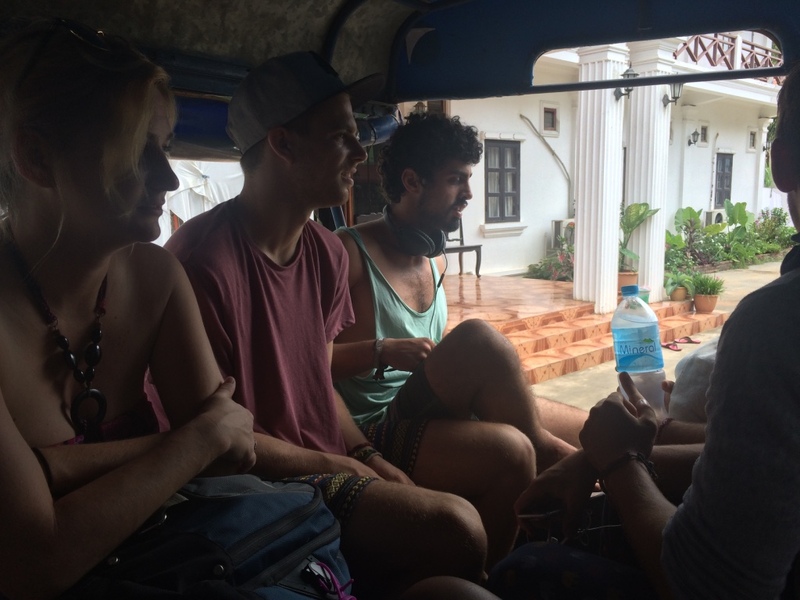 We had no idea what was going on, but the tuk-tuks drove us out of town - then abruptly pulled off the road and turned into a private home. At the home, the minivan was waiting for us. They split us into two groups, made us all get into two tuk-tuks, shoved all our bags into the minivan, then the empty minivan (with our bags) drove away. Basically, they were hiding from the police that the van was being used as a private transport vehicle out of town - which is easier when there's no tourists aboard. None of us had any idea what was happening; the entire thing was incredibly shady-feeling, and some people were beginning to worry because all our bags were gone. We passed the police checkpoint (didn't get pulled over), then awhile later, pulled into another totally rando neighborhood where the minivan and our bags were waiting. Then we were allowed to get on and continue on our way. 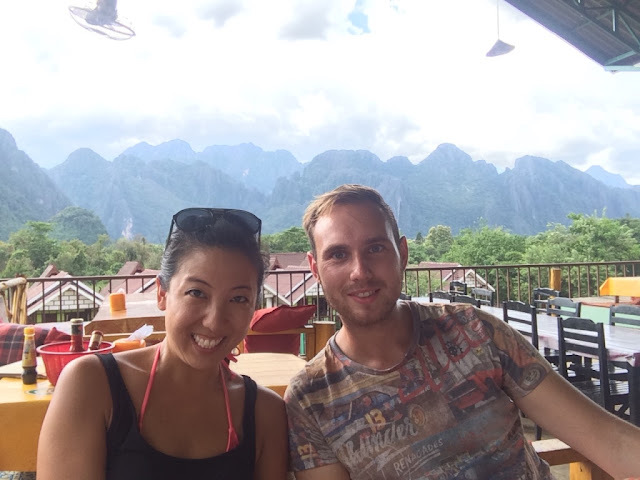 The same thing happened right before we got to Vang Vieng - we had to pull over to some small shady town where two tuk-tuks were already waiting for us so we could get in and pretend we hadn't just been on a private transport vehicle with all our huge backpacks in tow. 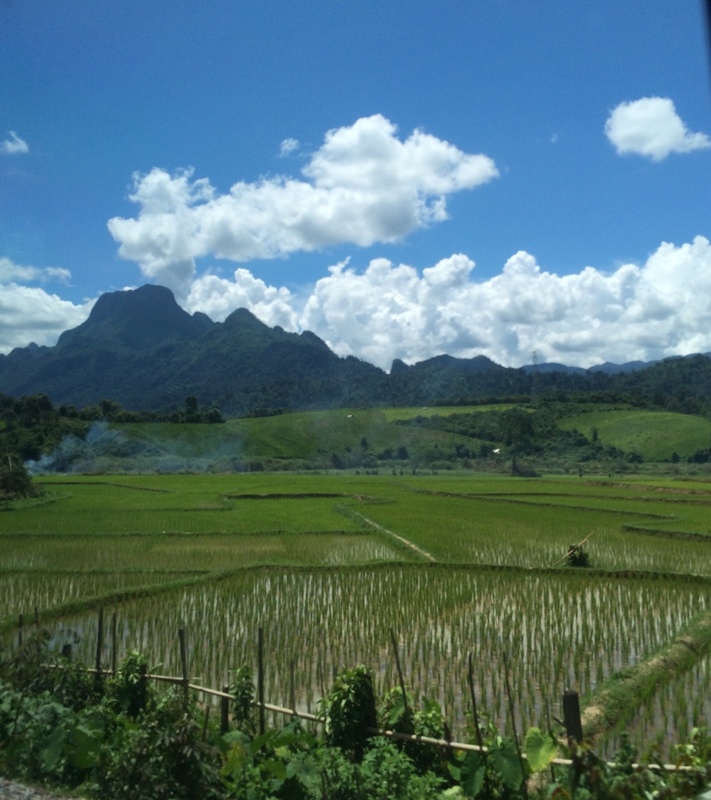 We all joked that the drive from Luang Prabang to Vang Vieng is probably only 2 hours - the entire journey takes 5 hours because of all the shady "hiding from the government" activities they have to do. It's strange being in a country you're not familiar with - the drivers acted like it was all so normal and planned out - while we were all panicking that something super shady was going down and nobody knew what was happening. It does speak to the power of putting your trust in other people - I mean, some random man with limited English skills basically took all our bags and drove off with them in a minivan with no explanation except "10 minutes." Such a travel moment. Laos is officially called "Lao PDR", which stands for People's Democratic Republic. However, the saying here is that "PDR" secretly stands for "Please Don't Rush" - because no one here is ever in a hurry. Laotian people are so laid-back and chill about everything - they truly do run on their own time. My Lonely Planet says that Laotian people are dedicated to fun and if something is no fun, it is quickly abandoned for something that is. Flattering, LP. 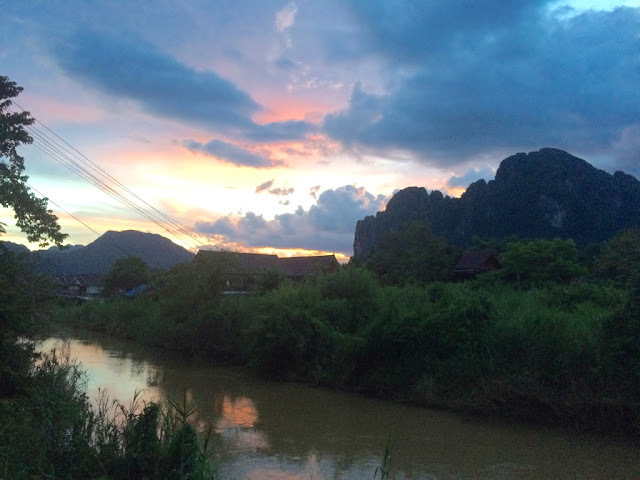 Laos is seriously fantastically beautiful. It's straight up "The Jungle Book" - so many commanding mountains, jungle-y trees, rivers, and lush green fields. There are tons (>270 million TONS) of bombs that were dropped during the Vietnam War by the U.S. - it is the most heavily bombed country per capita in the world and throughout all of history. About 1/3 are still unexploded, and <1% have been detonated to this day, 40 years later. Lao citizens are still dying every day from these bombs (40% of them children) - and the U.S. is spending a ridiculously small amount in the cleanup effort - not even a fraction of what they spent to actually drop the bombs back in the day. It's probably more complex than that, but just saying. I loved Laos! 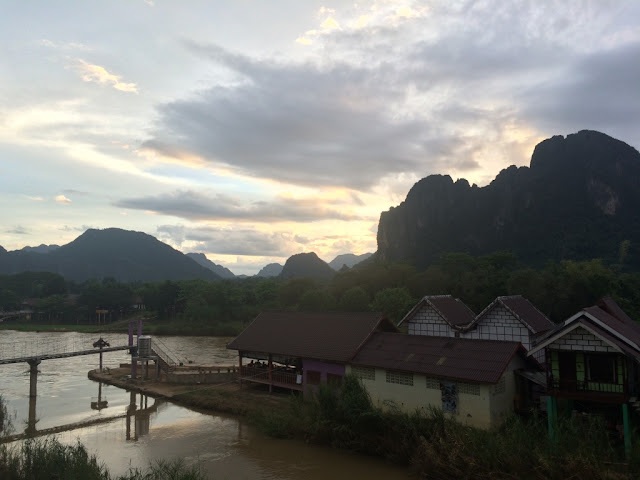 If you are a nature/outdoor/scenery lover - or you love doing rugged things - you have to make sure to add Laos to your list. The things I did are only a fraction of what you're able to do in this country. Believe it. For now though, onto Vietnam!